The murders of a mother and her two young sons yesterday shocked the peaceful community of Plumbago Avenue, Phase Two, La Horquetta, where the family lived. Vonetta Haynes-Reyes, 31, and her sons Malik, eight, and Makasi Reyes, five, were found dead by police who had been alerted by someone who went to the family’s home yesterday afternoon. 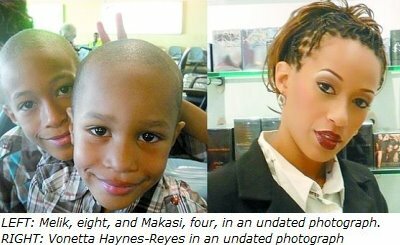 Haynes-Reyes was a senior beauty advisor at Senses at Trincity Mall. Police sources state that at about 3 pm, a person who knew the family visited the home and called Haynes-Reyes’ cellphone and heard it ringing inside the house. He knocked on the door but there was no response. He looked into the window and saw the body of one of the two boys on the floor. The man called the police, and moments after, officers arrived and knocked down the locked door where they discovered the three bodies, reportedly with their throats slits. Upon their discovery, officers cordoned off the street, preventing any vehicle and pedestrian access. Scores of curious residents gathered within the limits of the police barricade. While most persons didn’t want to speak to reporters, those who did said they were terribly shocked by the murders and described Haynes-Reyes as a very peaceful, loving and quiet person. The father of the two boys, Selvon Reyes, was notified of the killings and when he arrived he broke down in tears. He was taken inside a neighbour’s home where he was comforted by friends and relatives. Haynes-Reyes’ uncle, Martin Mitchell, described her as “a very pretty and sweet woman who was very nice”. Mitchell who described the incident as shocking said he was in Aranjuez collecting a package when he got the news. He then left the package on the pavement and made his way to the scene. “The circumstances of this incident are very strange. I was told that at about 1 pm, neighbours saw a Nissan motor vehicle drive out of the yard and then the police told us that the door was locked,” Mitchell said. Earlier, Mitchell disclosed that Haynes-Reyes was looking forward to the upcoming marriage of her mother who lives in New York. On her Facebook page, friends and relatives of Haynes-Reye expressed their horror about the killings. A family friend Pauline Hazzard said the woman’s mother, brother and sister were expected to leave on a flight last night from the United States to Trinidad to make preparations for the funeral. Minister in the Ministry of the Office of the Prime Minister and MP for Arima Rodger Samuel was also on the scene as he lives a few streets away from where the murders took place. He said residents were stunned and hurt. “You could never be comfortable with any loss of life because it naturally hurts us all. It is especially hurtful to us because this is normally a very quiet area and we are shocked that such a crime can take place…it’s not what we are accustomed to and it’s a very sad thing,” he said. He said he knew the family from seeing them walking along the streets but he did not know them personally. Up till 10 pm, the crime scene investigators were still at the house searching for clues. A mother and her two young children were found murdered at their Plumbago Avenue, La Horquetta, home yesterday. am not goin to say dt her husband and the father of the two boys did this but if he did dt means hes gone mad..a mean who wud hve the guts to watch two boys in dere faces and kill them…smh..the police needs to hurry n find the perpertrator…dey need to look for fingerprints..its really a sad story..b/c i hve seen pics of her n she is a beautiful lady….R.I.P…u r in a better place now…trust me..
A horrific tragedy,such a waste of human life,total disregard for God,seems as if this perpetrator knows that he/she is already doomed. GOD have mrecy. May their souls rest in peace. Condolences to the family. I am sure it will be very difficult for them to come to terms with this. These children did not deserve this kind of death nor the lady in question. Why? Would be the question going through the mind of everyone. But I am sure there is quite a story behind all of this…A very, very sad story. WHO KILLED MY WIFE, SONS? Hours after identifying the bodies of his two sons and wife at the Forensic Science Centre, in St James, Selvon Reyes called for swift justice and pleaded for the police to find the killer who snuffed out the lives of his children and their mother. Citizens are still reeling in shock over the brutal killings of Vonetta Haynes-Reyes and her two sons, but none more so than her close family, friends, neighbours and colleagues. Minister of Gender, Youth and Child Development Verna St Rose-Greaves wants communities to take responsibility for protecting women and children from becoming victims of male/female relationships. Once again we are faced with a dreadful multiple murder in our society, and what makes some of these more frightening is that, once again, this is not apparently gang or drug related, but involved a young mother and two children in the presumed sanctity of their home. this is rediculous, innocent people whomever is responsible for this is a monster and i hope and pray for the family of these people may you guys rest in peace am in tears. May God grant u the your kids peace. R.I.P. Government has agreed to pay for the funeral of murder victims Vonetta Haynes-Reyes and her two sons, Malik, eight and Makasi, five. this i’m sadden by.how long would it take befor our nation leaders see the need for capital punishment.would more mothers and innocent children have to be murdered by these blood thirsty monsters befor something can be done?please let us know. A 24-year-old man has confessed to the brutal slayings of Vonetta Haynes-Reyes and her two sons, Malik, eight, and Makasi, five, police sources disclosed yesterday.